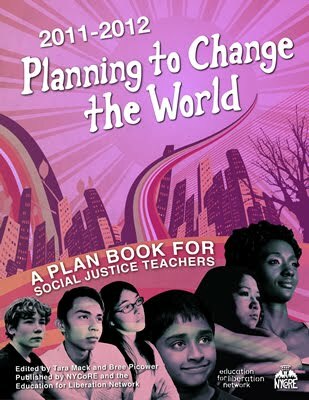 Teachers For Social Justice: THE STRIKE IS STILL ON! It's not over yet-democracy in is action in the CTU, as the House of Delegates decides how to proceed with the tentative agreement (see below for the CTU website release on the HoD meeting today). Let's get back on those picket lines at the schools Monday morning and do other strike support as well. Watch the CTU & TSJ website for updates, and don't necessarily believe what you hear in the news! Solidarity!! Some 800 delegates of the Chicago Teachers Union duly elected from each school and workplace convened Sunday afternoon to discuss the framework established during negotiations between the Chicago Teachers Union and the Chicago Board of Education. Officers presented a 23 page document outlining the most important points of the agreement whose outline has been worked out between the two parties. That tentative agreement is expected to number over 180 pages. After a civil and frank discussion, the House of Delegates voted NOT to suspend the strike, but to allow two more days for delegates to take the information back to the picket lines and hold discussions with the union’s more than 26,000 members throughout Chicago. Teachers and school staff will return to the picket lines of the schools at which they teach at 7:30 a.m. Monday and, after picketing together, will meet to share and discuss the proposal. Citywide members will picket at the Chicago Public Schools Headquarters, 125 South Clark, at 7:30 a.m. and will meet thereafter at a downtown location. The delegates voted to reconvene on Tuesday afternoon. House of Delegates to review new contract language this Sunday at 3:00 p.m.
CHICAGO - The Chicago Teachers Union (CTU)'s ruling body will decide whether or not to call off its strike against the Chicago Public Schools during a 3 p.m. House of Delegates meeting tomorrow at Operating Engineers Hall, 2260 Grove Street. The Bargaining Team is expected to share new details about proposed contract language which includes a number of victories for teachers, paraprofessionals, clinicians, and students. The earliest teachers and other school personnel could return to their schools could be Monday; however, no decision has been made to do so. Delegates, the elected leaders of their schools, have the authority to suspend or lengthen the strike. They could also ask for at least 24-hours to talk to individual members in their schools before making a decision on what to do next. 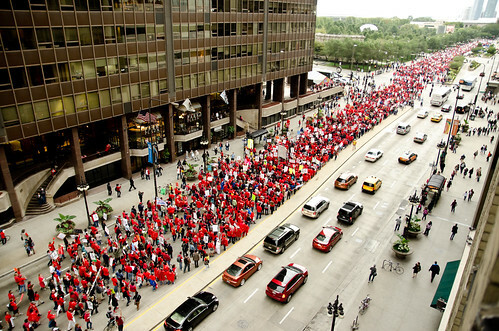 The 29,000-member CTU has been on strike since Sept. 10. "We are a democratic body and therefore we want to ensure all of our members have had the chance to weigh-in on what we were able to win," said CTU President Karen GJ Lewis. "We believe this is a good contract, however, no contract will solve all of the inequities in our District. Our fair contract fight has always been about returning dignity and respect to our members and ensuring resources and a quality school day for our students and their families." Fairer Evaluation Procedures: The new contract will limit CPS to 70% "teacher practice," 30% "student growth" (or test scores)-which is the minimum by state law. It also secures in the first year of implementation of the new evaluation procedures there will be "no harmful consequences" for tenured teachers. It also secures a new right-the right to appeal a rating. "This Union has proven the Chicago labor movement is neither dormant nor dead," Lewis continued. "Our members are on the line because we all believe there is an assault on our profession and public education in general. We will always do what is in the best interest of our students and our own children, many of whom attend these schools. We showed our solidarity and our strength, and with this new contract we have solidified our political power and captured the imagination of the nation. No one will ever look upon a teacher and think of him or her as a passive, person to be bullied and walked on ever again." The Chicago Teachers Union represents 30,000 teachers and educational support personnel working in the Chicago Public Schools, and by extension, the more than 400,000 students and families they serve. The CTU is an affiliate of the American Federation of Teachers and the Illinois Federation of Teachers and is the third largest teachers local in the United States and the largest local union in Illinois. For more information please visit CTU's website at www.ctunet.com.